World over, a large number of universities and institutions are making way for open access repositories. Why have Indian researchers shied away from it? On October 28, 2017, a group of panelists in the faculty hall at Indian Institute of Science (IISc), discussed the framework of policies that can help academic institutions embrace open access in letter, spirit and action. 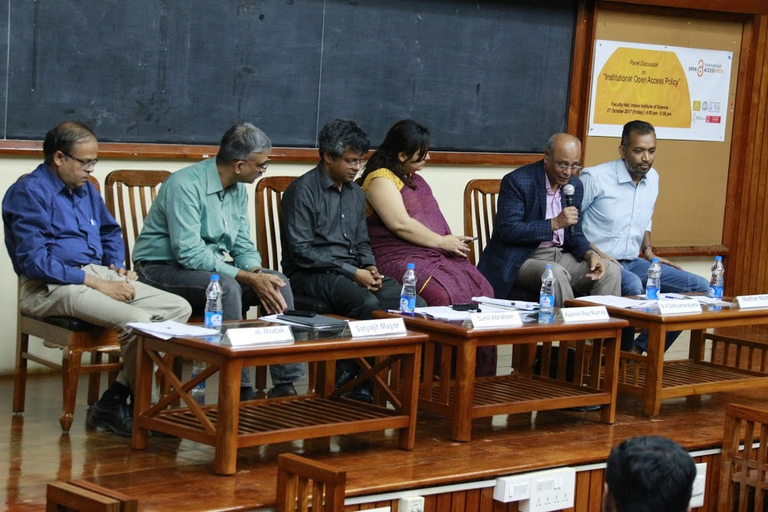 The discussion was a part of week-long activities organised by DST Centre for Policy Research (DST–CPR) at IISc to increase awareness and acceptability for open access publishing in India. The panel included Jayant Modak, deputy director, IISc, Satyajit Mayor, director of National Centre for Biological Sciences and inStem, Padmini Ray Murray, vice-chair, Global Outlook: Digital Humanities, N.V. Sathyanarayana, chairman and managing director, Informatics India Ltd and Madan Muthu, visiting faculty at DST–CPR at IISc. The discussion was anchored and moderated by Sunil Abraham, executive director, Centre for Internet and Society. Open access is a form of publishing that makes the fruits of research, such as journal papers and other forms of data accessible to anyone interested in it, without a cost. World over, a large number of universities and institutions are beginning to give up the library subscription model of publishing to make way for open access, owing to the latter’s lower cost and higher visibility. In India too, funding agencies like DBT and DST have laid out guidelines that require researchers to submit their research output in open access repositories. Ironically though, most researchers have shied away from submitting their work in the repositories. Which raises the question, why? In fact, this was one of the first questions that the panelists debated upon. Abraham initiated the discussion by asking the panelists – What are the weaknesses of DBT–DST policy on open access? Why have a large number of scientists not followed the guidelines laid by the policy? Is it because the policy document does not talk about any punitive measures for scientists in the event of not depositing their work in the institutional repositories (IRs)? And, how can the policy be improved? Modak opened the argument by saying that we as a nation are good at making provisions but bad with implementation. He agreed that scientists are yet to warm up to the idea of open access but was disinclined on using punitive measures to force scientists into submitting their work in IRs. Mayor, in agreement with Modak, said that the policy document is advisory in nature and sort of lacks ‘teeth’. However, he too was against the use of punitive measures. Sathyanarayana, the fourth panelist and a strong advocate of open access said, the policy document “lacks an aggressive strategy” to drive a disruptive and “fundamentally voluntary model” of adopting open access. He asked the other panelists and the audience, “why have repositories like ResearchGate become so successful and attractive for researchers? Why can’t open access IRs be modelled along the lines of such repositories? His argument was that the IRs can be fashioned in a way to make them a ‘convenient step in the process of research’”. One suggestion that he offered was that IRs can be structured as a paper submission platform. So that anybody who is interested in publishing their work first puts it up in the IR and only after that the process of going to a journal begins. Muthu, the fourth panelist and a long-time crusader for open access in India said that scientists in India have stayed away from the open access publishing because they don’t fully realise that in traditional models of publishing, you surrender all copyrights of your work to the publisher. He added that more scientists can be encouraged to adopt the open access model of publishing by making IRs institute-managed, easier to use and as a mandatory step in the process of publishing. Mayor added to this argument by saying that the idea of submitting (unpublished) work in an IR is quite similar to the concept of pre-print archives which are fast becoming a powerful way of sharing work. Almost all top journals accept work that has been published in a pre-print archive. In fact, in the physical sciences, people have been using pre-print archives for a long time and now slowly, even the biology community is warming up to it. Murray emphasised on the need to talk to students about open access and making them aware of the ways to design their metadata so that it is amenable to open access repositories. As the discussion inched closer to its final moments, it veered off towards the costs of open access publishing. Modak said that in the last year alone, the amount of money IISc has spent for publishing papers has doubled. If all researchers start opting for open access (OA) journals/hybrid-OA journals that charge the authors nearly double of what traditional journals do, then publishing papers will become unsustainable. It is authors’ inertia that is stopping open access from becoming the obvious model of publishing, said, Muthu. In conclusion, Abraham summed up the arguments and acknowledged that there are many dimensions to open access and an institutional policy on OA cannot be framed in a vacuum. Common people need to participate in the debate to shape the direction the policy takes. Apart from the panel discussion a poster competition and a quiz competition were organised as part of the OA-week activities. DST–CPR was joined by the student’s council at IISc, Centre for Contemporary Studies, JRD Tata Library and IndiaBioscience in organising the activities. This article was originally published on IndiaBioscience. Read the original here.